Established in 1973 under the direction of European master Andrew Maglia, Omnibus Studios Inc. is Michigan's premier stained glass studio. Omnibus Studios provides custom design and fabrication of traditional and modern stained glass for churches, homes and corporations. 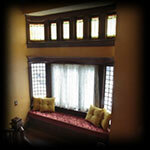 We specialize in custom stained glass windows, doors, ceilings, cabinets, and one-of-a-kind pieces of art. We are proud of our 46 years of customer satisfaction, demonstrated by our "Accredited" membership status with the Michigan Better Business Bureau.